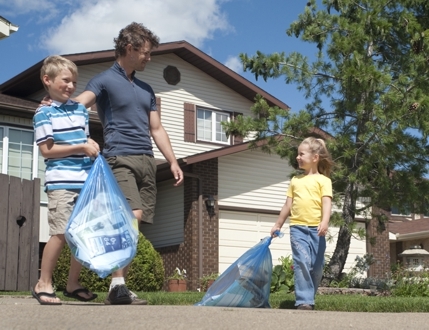 Single-family homes, duplexes, fourplexes and some townhouses receive Blue Bag collection of household recyclables. It's easy to do. No sorting is required. Just place your clean recyclables loosely into blue see-through plastic bags and set them out for collection on your scheduled collection days. When is my Blue Bag collected? Blue Bags are collected on the same day as your garbage. Find out your pick-up day by checking the collection schedule. Please have your Blue Bags out before 7am on your collection day. Where should I put my Blue Bags on collection day? Your Blue Bags should be placed one metre (3 1/2 feet) from your regular garbage containers so that they're not mistakenly collected as waste. Where do I get Blue Bags? Blue Bags are available at all major grocery and hardware stores. The City of Edmonton does not sell blue bags. Do not use green or black garbage bags because they will be collected as regular garbage. Only material placed in or beside the Blue Bags will be collected as recyclables. What happens to the Blue Bag Materials? When the blue bags are collected from your home they are taken to Edmonton's Materials Recovery Facility where they are sorted and baled for market. They are then sold throughout Alberta, BC , the western US and Asia. Garbage and recycling are collected weekly on the same day of the week year-round, including most statutory holidays. What can be recycled? What goes to the Eco Station? What goes in the garbage? It's all here.